Five o'clock in the morning, time to get up. It is still dark outside, and I try to convince myself that I need to get out of the bed now, if I want to catch all the trains and the only bus to Repovesi national park. Coffee, smoothie, an apple and pear put into the side pocket of the Pinnacle, and off I go to the railway station, which is already busy with people. Five hours later the bus driver lets me out at the road to Lapinsalmi, the entrance of the national park. Already here there is silence, and only the occasional bird song disturbs the tranquility. Four kilometers later I stand at the entrance, a huge parking lot is witness to the masses of people which must be here in the summer and on weekends. On the way to Lapinsalmi. On top of Lapinsalmi hanging bridge. The trail towards Lapinsalmi hanging bridge is well worn out, testifying that the weekend must have been busy with folks - snowshoes not yet needed. The clouds disappear, I cross the bridge and go down to the hut. Lunch time, refilling water bottles in the stream, observing the woodpecker close by, enjoying the sun. As I continue, I see the tracks of the guy which got out a few kilometers before me, and follow them back to the hut. He carries a 70+ l backpack, has a Pulka with him, and is of course German. We chat a few minutes, but he ain't too social so I continue. I follow the trail for a moment, but because it goes up and down the hills I decide to take the easy route - the frozen Katajajärvi lake. I always feel a bit uneasy on the ice, even if it is -8°C and only a few centimeters of snow cover, my concentration is on and I am listening to possible cracks. I should feel save, after all there's a well worn ski trail, but somehow I'm not totally relaxed. Leaving tracks on Katajajärvi lake. View on Mustavuori hill, across the Kuutinlahti lake. Spring is in the air - most trees were already snow free. I walk over Kuutinlahti lake towards the hut, have a short peek inside and continue towards the Mustavuori hill. A 109 m ascent, and some folks did this without snowshoes, potholing the complete way up - in nearly a meter of snow, quite a feat. The view is worth it, though. I walk along the cliff, take in the view and spot a nice site where I'd like to pitch the tarp and start compressing the snow before I continue to the viewing tower, so it has time to settle. View from the tower across Kuutinlahti lake and the Ruskiasalmi strait. 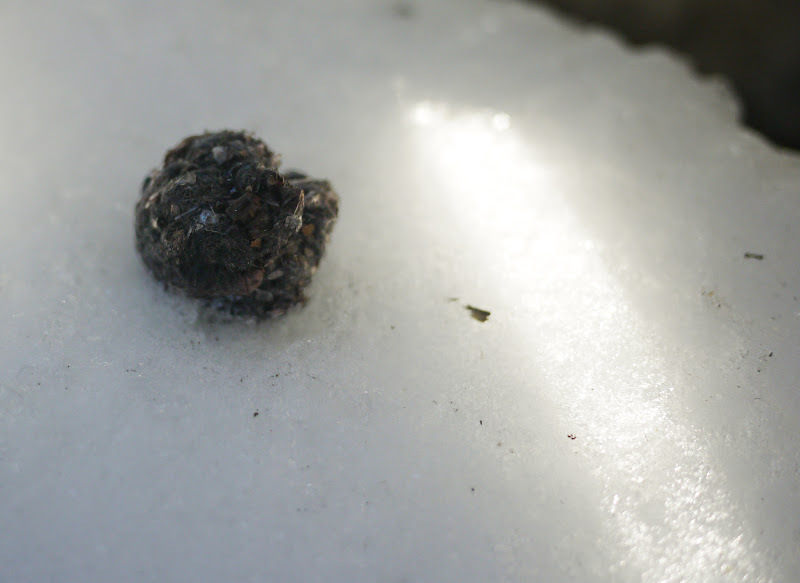 The view tower seems to be a favourite spot of owls, as this owl pellet shows. Back at the designated site to pitch the tarp I am encountering a problem as I put the trekking pole in the snow - another 90 cm of snow till the bottom. I wonder, should I dig a snow cave, bivy under the clear sky or go down to the hut? After a while of wrestling with my own comfort zone, I decide to take the easy way out, and descent down towards the hut. Dusk ain't too bad from down here. The fire is going, sausages are barbecued, I sawed plenty of wood for the night, and enjoy the clear sky with its millions of stars. The ice is cracking, an owl is hooting, and I roll out the sleeping bag and mats, boil water for the night bouillon and tuck myself in. A fine night, waking up every once in a while to throw more wood on the fire, and relaxed I wake up at seven the next morning. The fire is still going, and I heat up the rest of the bouillon for breakfast, pack up and start walking again. The collapsed cliffs at Kuutinkanava, an amazing acoustic here, no wonder they have concerts here in the summers. I head towards Kuutinkanava over the lake, enjoy the echo, have a look at the old log flute and continue through the forest towards the Katajajärvi fire site and onwards towards Kapiavesi fire site. Passing over the ice towards the Lapinsalmi entrance, I see the German's red pulka in the distance at the Lapinsalmi hut - apparently he didn't venture further and stayed there for the night. The four kilometers towards the main road are walked quickly, and ten minutes later I was able to hitch a ride to Kouvola. Mouse tracks in the snow. It were two beautiful days out. I am a bit disappointed with myself that I didn't succeed in wildcamping on top of Mustavuori, I reckon the sunset and dawn would have been very impressive from up there - the next time then. Too bad I also only had two days time, there would have been more hills to climb and sights to see, and at the moment it is perfect to navigate there, as you can use the frozen lakes, which is a lot easier than scrambling through the forest. I hope to return there while the lakes are frozen and the snow is covering the land, it is a beautiful national park and not many people are around. Anyone want to go for a weekend?